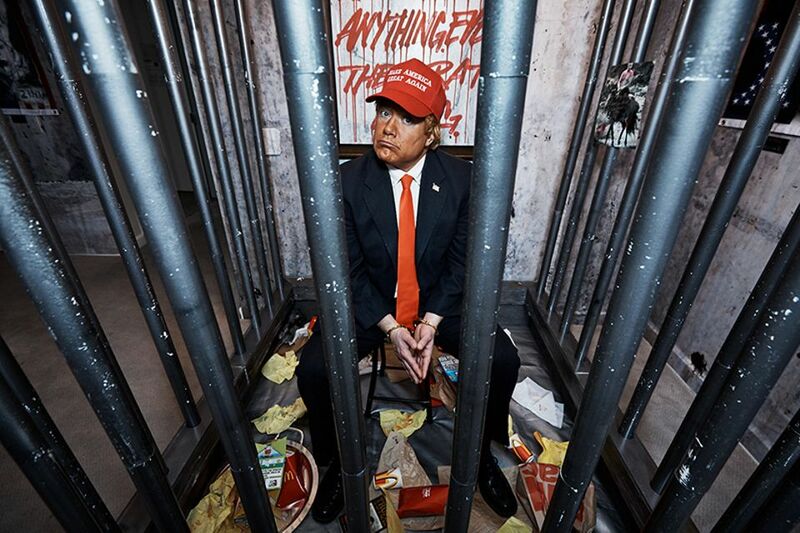 On Friday (30 March), the anonymous collective Indecline staged their most daring art stunt yet, building a prison cell for US president Donald Trump inside a suite of the Trump International Hotel and Tower in New York. The cell held a handcuffed Trump impersonator and several live rats, and was littered with McDonald’s food wrappers, a paperback copy of the 1987 book Trump: The Art of the Deal and a photo of a shirtless Vladimir Putin on horseback, covered with a love note and lipstick kiss. The group, who were behind the series of naked Trump statues that appeared in five US cities in 2016 and a mock cemetery that popped up on the grounds of the Trump National Golf Club in Bedminster, New Jersey earlier this year, say the work was inspired by “Trump’s likely fate”. The group built most of the installation—called The People's Prison and funded in part through the sale of one of their naked Trump statues—in a Brooklyn warehouse and transported the parts to the Manhattan hotel in suitcases. A video documenting the process shows ususpecting hotel staff helping to bring the luggage up to the room, where masked members of Indecline, some donning plush Trump Hotel bathrobes, then empty the living room of furniture, paper the walls to look like cement and install the cell. The group invited a small number of press to a private “unveiling” of the 24-hour piece on Friday night, before dismantling the work and checking out of the hotel on Saturday. Sitting under a crystal chandelier inside the cell, and wearing a red “Make America Great Again” hat and handcuffs, an actor doing a passable impression of the president spouted one-liners in Twitter-like bursts: “I never lose—sometimes I lie down because I’m tired of winning”; “I told Comey to go homey—total trainwreck”; “I never colluded with Russia—I never gave intelligence to Russia officials because I never had intelligence”; “the stock market is over 25,000—that’s almost as many calories as Chris Christie eats in one meal”; and “it’s good that the journalists are female—we like that”. Behind “Trump”, a framed picture painted with red text read: “rats will eat anything, even their rat king”. 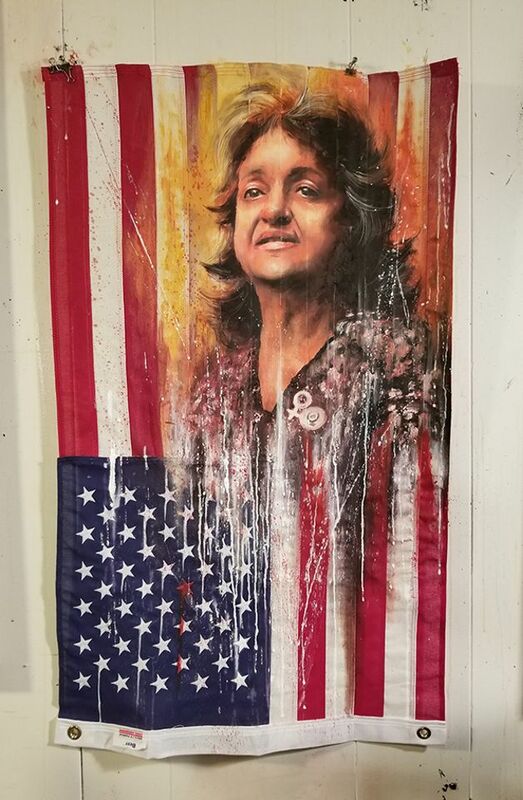 Hanging on the walls surrounding the cell were a series of American flags painted over by other artists like Ann Lewis, Molly Crabapple and Gabe Larson with portraits of activist figures including Malcolm X, Edward Snowden and Angela Davis. These are “greater American revolutionaries, freedom fighters and radicals who fought against tyranny and people like Trump”, says a spokesman of the collective. The flags are due to be shown at Gallery 30 South in Pasadena, California in a month-long exhibition starting 11 April, with proceeds from the show going to benefit arts and social justice charities.